If you are considering knee surgery the following total knee replacement information might help you understand the procedure and implants better. Sometimes a total knee replacement is the only option for reducing pain and restoring a normal activity level. If your and your doctor decide a total knee replacement is right for you, the following information will give you an understanding about what to expect. 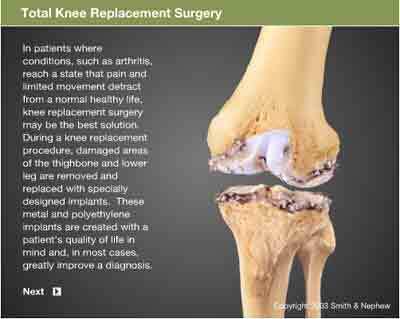 A total knee replacement involves cutting away the damaged bone of the knee joint and replacing it with a prosthesis. This “new joint” prevents the bones from rubbing together and provides a smooth knee joint. In the total knee replacement procedure, each prosthesis is made up of four parts. The tibial component has two elements and replaces the top of the shin bone or tibia. This prosthesis is made up of a metal tray attached directly to the bone and a plastic spacer that provides the bearing surface. The femoral component replaces the bottom of the thigh bone or femur. This component also replaces the groove where the patella, or kneecap, sits. The patellar component replaces the surface of the knee cap, which rubs against the femur. The patella protects the joint, and the resurfaced patellar button will slide smoothly on the front of the joint. Once you are “under” the surgeon will begin by making an incision in your leg to allow access to the knee joint. He’ll then expose the joint and place a cutting jig or template on the end of the femur, or thigh bone. This jig allows the surgeon to cut the bone precisely so that the prosthesis fits exactly. Once the femur is cut, the tibia is cut using another jig for proper alignment of the knee prosthesis. The undersurface of the patella is then removed. Now it’s time to place the prosthesis. This begins with the femoral prosthesis, which is cemented in place using a special bone cement. Next the metal tray is attached to the top of the tibia. This will provide the weight-bearing surface of the femur. The plastic spacer is then attached to the metal tray. This will provide the weight-bearing surface of the femur. If this component should wear out while the rest of the artificial knee is sound, it can be replaced. This is known as a “revision.” Next the patellar button is cemented in place behind the knee cap. Finally, the incision is closed, a drain is put in, and the post-operative bandaging is applied.